If you want to lower your household expenses, take a look at your water bill. Does it seem high? Do you feel like you’re spending too much money on something so basic? Here are some of the best ways we’ve found to save money on your monthly water bill. If you haven’t replaced your showerhead since 1992, you’re literally washing money down the drain. Since the federal Energy Policy Act of 1992, showerheads are required to have a flow rate of 2.5 gallons per minute or less. If your current model was made before that year, it’s using at least twice the amount. When you switch, you’ll save up to a hundred gallons of water or more per shower. It may seem counter-intuitive, but washing dishes by hand actually uses more water than the dishwasher – up to six times more. To save even more water, only run the dishwasher when it’s full. If you don’t have a dishwasher, plug the sink and fill it with water to wash your dishes instead of letting the water run. If your washers are more than a few years old, they could be guzzling much more water than needed. Now is a great time to invest in more energy-efficient models. Look for appliances that carry the Energy Star or WaterSense seal. These often use up to 50 percent less water and energy per load. You might also consider buying a front-loading washing machine, which by design uses much less water than top-loaders. 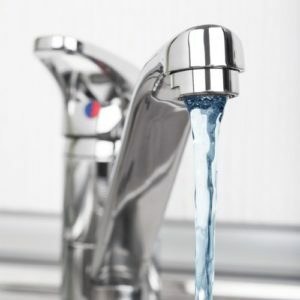 Did you know you can waste up to 2000 gallons of water a year because of a leaky faucet? Not convinced? Check out this online drip calculator that will show you exactly how those individual drips add up. Leaky faucets are fairly easy to repair yourself. Head to the hardware store and pick up a repair kit that walks you through the process. When you water your lawn, you can lose a significant amount to evaporation if you water in the middle of the day when it’s hottest. Instead, water first thing in the morning or at dusk to cut back on water wasted to evaporation. In addition to watering at the correct time, install rain barrels to capture rainwater. These containers allow you to gather runoff from roofs and gutters and store it for later use. Most of these containers come with an attachment that allows you to hook up a hose, making watering a breeze. Finally, have you ever considered how much water you are wasting by using your garbage disposal? They require a vast amount of water in order to properly function. Instead, start a compost pile. Those kitchen scraps you might normally send down the drain can be saved and composted. A few months later, you’ll have rich compost that can be used in your yard. Not only is this a way to save on your water bill, but it will also give a healthy boost to your garden.